Here again, nanotechnology is promoted as an enabling technology. Nano devices can provide a way to automate routine laboratory tests. They can deliver active treatment directly to affected cells, and that means fewer side effects with increased efficiency. Dr. Chad Mirkin is the Director of the International Institute for Nanotechnology at Northwestern University and he shows how with the new diagnostic devices a single sample allows doctors to do multiple tests. At the Dana-Farber Cancer Institute at Harvard, we learn how nano devices can be used to destroy specific cancer cells. Through nanotechnology, the practice of medicine is evolving from treating disease and illness to a practice that is predictive, personalized, and preemptive. There is a medical future where permanent nano-devices can roam the body to monitor, and provide early diagnosis and take action against diseases. 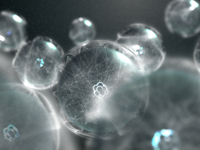 Nanotechnology is a powerful tool for advancing tissue engineering and stem cell therapy. Significant results have been obtained in creating artificial functioning interfaces between nerve fibers and electronic contact electrodes. This opens the way to control prosthetics and all kinds of implants. 3. Will Nano Save the Planet? - Environmental problems might be solved by nano solar cells, clean fuel additives, contaminant remediation, but are we creating pollutants more dangerous than the ones we already have? "More than Human presents the ways in which nanotechnology can transform medicine, as well as the upshot that it will have for human enhancement. Focusing on near- and mid-term applications, it offers a sober assessment of where the technology will take us in coming decades. The disc also engages the social and ethical implications of these applications and serves as a wonderful instructional resource." students may wish to discuss what they have observed, such as the interaction between science and business in research, predictions of possible applications of medical nanotechnology in their lifetimes, the ethics of keeping people alive almost indefinitely by rebuilding their bodies, and even career possibilities."